IT Blues: Why are Indian infotech firms losing steam? Analysts expect none of the India’s top-tier IT services companies, including Infosys, Tata Consultancy Services, Wipro, to see double-digit growth in revenue. Bengaluru: A few months can make all the difference. On 15 April, Infosys Ltd, which had clawed its way back to almost being the bellwether of the $150 billion Indian information technology (IT) services business that it once was, announced an upbeat forecast for 2016-17. It projected constant currency growth in revenue of between 11.5% and 13.5%, higher than Street expectations. Three months later, India’s second largest software services company cut the forecast to between 10.5% and 12%, after a poor fiscal first quarter. Chief executive officer (CEO) Vishal Sikka said the disappointing 2.2% sequential dollar revenue increase to $2.5 billion in the June quarter was both unanticipated and unexpected. It isn’t just Infosys. NASDAQ-listed Cognizant Technology Solutions Corp. expects to grow at-best 9.5% this year, compared with the 21% growth posted in calendar year 2015 (Cognizant follows the calendar year as its business year). Indeed, analysts expect that none of India’s top-tier IT services companies will see double-digit growth in revenue. That means they will perform below the IT services industry lobby group Nasscom’s prediction of 10-12% growth for the entire IT outsourcing business in India (provided the group doesn’t lower its own estimates). The April-June numbers of the companies bear this out. Infosys’s bigger rival Tata Consultancy Services Ltd’s dollar revenue increased 3.7% to $4.36 billion in the quarter ended June from the preceding three months. TCS reported a lower 3.1% quarter-on-quarter growth in constant currency terms, meaning its growth improved by 60 basis points on account of currency fluctuations. One basis point is one-hundredth of a percentage point. Wipro Ltd said its dollar revenue improved 2.6% sequentially to $1.93 billion (a 2% rise in constant currency terms), after it had earlier forecast quarterly growth of between 1% and 3% in constant currency terms in the first quarter. Net profit fell 10% from the preceding March quarter to $304 million. Cognizant cut its full-year revenue growth forecast sharply to 8.5-9.5%, implying the slowest pace since 1996, after posting a 5.2% sequential increase in revenue for the quarter ended 30 June. Cognizant now expects full-year revenue to be between $13.47 billion and $13.6 billion. None of India’s five largest software exporters managed double-digit dollar revenue growth last year. Worryingly, the earnings shocks came after brave and optimistic projections by the CEOs of most companies; 2016-17, the chorus went, would be better. Amplifying the pain at homegrown technology firms is the strong performance by Accenture Plc, which does more business than TCS, Infosys and Wipro put together. Accenture recorded an 8.5% year-on-year dollar revenue growth in the March-May quarter, better than two of India’s largest software firms (see table 1). Understandably, spooked investors are running for cover (see table 2). Between 1 January and 30 August, Infosys shares fell 5.75% and Wipro shares retreated 12.6% even as the Sensex, the benchmark index of BSE, gained 8.52%. TCS stock is an outlier, gaining 4.5%. Brexit did, but Britain’s vote to leave the European Union on 23 June, which weakened sentiment and made the pound sterling slide against the dollar and rupee, hasn’t been cited by any of the IT services firms as a cause of concern. Four reasons explain the underperformance. Firstly, Indian technology firms seemed to have played a game of one-upmanship, raising expectations when, in reality, 2016-17 was going to be as challenging, if not more, than the previous year. Indeed, Cognizant has consistently maintained that demand will be weak this year (see graph 3). Many large investors now believe there is a mismatch between what the captains of Indian IT industry say and the reality on the ground. This is one reason why worried investors have punished the stocks, especially of Infosys. Secondly, global banks and insurance companies, which contribute 25-40% of the revenue at top technology companies, are outsourcing less work. TCS’s banking, financial services and insurance (BFSI) business, which accounts for 40% of revenue, grew only 1.7% in the fiscal first quarter, slower than its 3.7% sequential revenue growth. Thirdly, even though technology firms have talked a lot about digital business (newer technologies such as cloud computing and mobility and social platforms), the underlying fact is that for now, revenue from these newer technologies is not offsetting the business lost from legacy business such as managing servers and developing applications. Finally, the plans of both Infosys and Wipro continue to be hampered by poor execution, leading to delays in project completion. All of these have played out in the context of newer technologies that are altering the way outsourcing companies have done business. The traditional approach by outsourcing companies of deploying an army of engineers at cheaper locations to complete work for Fortune 1000 customers is coming under pressure as automation and artificial intelligence (AI)-powered platforms and cloud computing erase the labour arbitrage enjoyed by these firms. Consider Infosys: In April, it sounded confident after reporting a 9.1% increase in revenue to $9.5 billion in the year to March. “Our guidance which we see is not conservative or liberal but this is the visibility that we have and, hence, we are quite excited about the year ahead," Infosys’s first non-founder CEO Vishal Sikka had said then. In April, Infosys expected to grow at-best 13.8% in 2016-17 (this meant Infosys expected to add $1.31 billion in incremental revenue, the highest new business done in a year since inception in 1981). Few analysts thought the growth outlook to be aggressive. After all, Infosys’s larger rival, Cognizant, flagged softness in demand when declaring its results in February. Cognizant said it expected to grow at-best 14.3% as the management was worried about slow client spending among global banks and in the healthcare space. Unsurprisingly, a poor show and weak commentary on 15 July made shareholders punish Infosys stock as shares plummeted 8.81% on Black Friday for investors, who lost ₹ 23,796.34 crore of wealth in the process. “Large institutional investors have already been moving out of the tech sector for some time now. Now, historically, Infosys has been very transparent in its commentary to the market. But this time, the company surprised everyone when it sharply revised downward its guidance, and this certainly did not go down well with everyone," said the head of a large domestic institutional firm, which holds Infosys shares. Infosys strongly refutes any suggestion of aggressive guidance. Sikka maintains the company’s outlook is based on the demand environment. Strangely, even though Cognizant revised downwards its growth guidance to at-best 13%, Indian IT firms maintained a disconcerting silence, and there was no clear mid-quarter update on business. “Not much has changed in recent months except that Indian firms’ growth outlooks are being reduced towards more realistic views of industry demand," said Rod Bourgeois, the founder of US-based DeepDive Equity Research. “Our view heading into 2016 was that analysts’ growth estimates were ‘complacently steep.’ This is proving to be the case, but it doesn’t mean industry demand is much worse. It just means that many analysts and certain IT services management teams misgauged the industry’s growth trajectory," said Bourgeois. 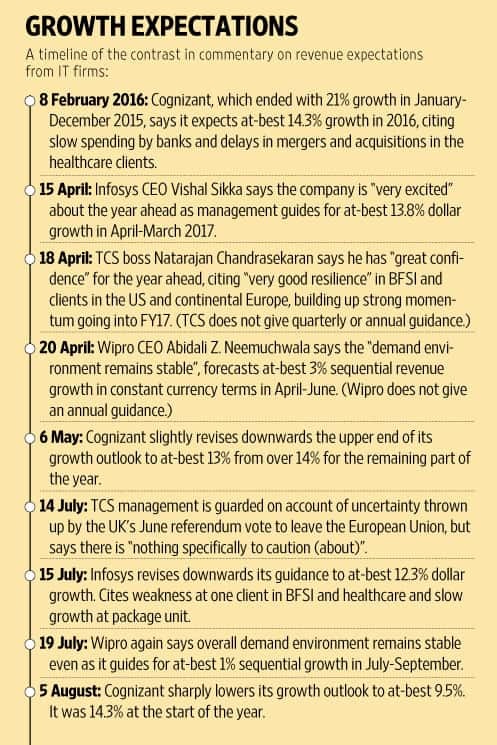 “Both Infosys and Wipro seem to be in a constant state of ‘quarterly panic’, being far too reactive to one bad quarter, while consistently being over optimistic about the bounce-back," said Phil Fersht, CEO of US-based HfS Research, an outsourcing-research firm. “They all just need to take a deep breath and call it how it is—a slowing industry that needs to reinvest in digital capabilities and intelligent automation in order to reap bigger rewards in the future." This brings us to the second theme of less business for IT firms from big banks such as Citigroup Inc. and Bank of America Merrill Lynch, which are the mainstay of IT firms. BFSI accounts for over 40% of revenue for both TCS and Cognizant, while it brings 33.5% of total business for Infosys and constitutes 26.2% of total revenue at Wipro. Since 2011, BFSI revenue at TCS, Infosys and Wipro has grown at a compound annual growth rate, or CAGR, of 9.15%, 4.85% and 4.26%, respectively. In the April-June period, again, BFSI grew 1.7% at Infosys while Wipro reported an improved 3.5% increase. Declining technology spending, mainly in application development work, from big banks even as large technology vendors see rising competition from mid-tier firms, driving down prices, and rising automation cannibalizing the existing model of billing clients on human hours are three primary reasons. Further, financial firms, from banks to stock exchanges, are exploring newer technologies such as blockchain to cut settlement times and bring down costs tied to international payments. “The growth challenges being faced by large Indian IT services firms are primarily due to maturing demand for traditional services such as application maintenance, combined with more intense competition," said Ray Wang, founder and chief executive of Constellation Research, a technology advisory firm. “At the same time, Indian firms have substantial hills to climb in order to better compete for digital or next-generation services." The third theme of ‘Digital’ is the most complex in the jigsaw. Amid all the tall claims made by homegrown IT firms, the newer technologies are not offsetting the loss in revenue from legacy work. “For now, the answer is yes. We are not seeing, say, a $1 dollar saved by CXO at client in the traditional or legacy work being deployed in newer areas," Infosys chief operating officer U.B. Pravin Rao said earlier this year. “But we believe this will change in the coming years." To understand this impact better, sample this: TCS claimed that its digital business grew 53.2% over 2014-15 to become a $2.28 billion business last year. 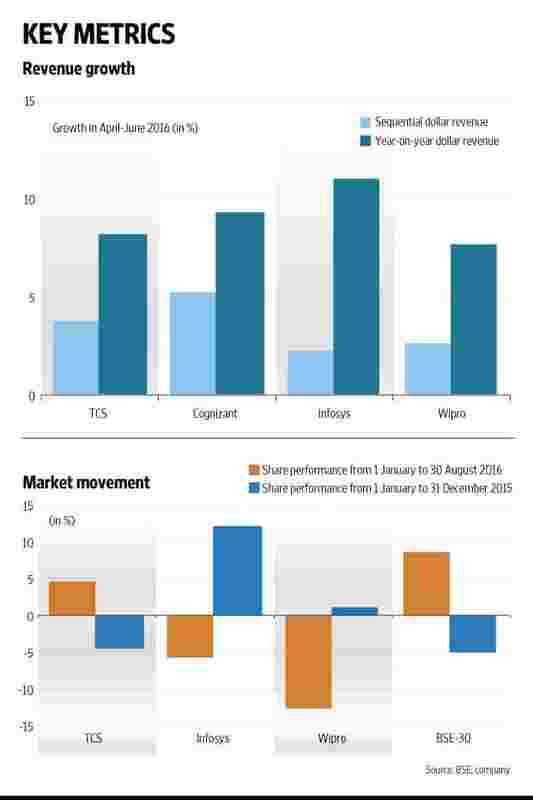 Mumbai-based TCS only grew 7.1% to end with $16.5 billion in revenue last year. So, much of the ‘digital’ business the company won replaced existing revenue from ongoing projects. This means that as more existing contracts have elements of digital technology, the duration and value of contract will get shortened, translating to more existing contracts coming up for rebids. Essentially, this translates to more revenue loss irrespective of how well an IT vendor can execute. None of the companies disclose what percentage of contracts comes up for rebids every year. Most outsourcing contracts are multi-year contracts. But, typically, for a company of the scale of Infosys, with $9.5 billion in revenue, about 15-20% of business comes up for renewal every year, with the company losing some business to competition, according to multiple executives and analysts. This number will significantly go up in the coming years, and only companies which have better technologies to offer clients will be able to retain customers. This explains why growth for most companies is slowing. “Our research says more intense competition is making it generally more challenging for services firms to retain revenues on existing deals," said Bourgeois of DeepDive Equity Research. Finally, poor execution is hurting Infosys, a fact conceded by Sikka. Poor account mining or inability to generate more business from its largest clients continues to plague Wipro. Since September 2014, Wipro’s quarterly revenue has increased by 6.23% to $1.88 billion. However, during this time, Wipro’s top clients have done less business with the company. “As mentioned in the investor meet held in Pune on 26 August, we will be able to give a more accurate picture of our guidance in October after executing Q2 and once we have assessed Q3 & Q4. Our guidance is a statement of fact and reflective of what we see at a point of time," said a spokeswoman for Infosys. On Friday, 26 August, Infosys, in an interaction with analysts in Pune, reiterated its guidance of growing at-best 12.3% in dollar terms. Again, the consensus view of at least nine analysts is that it is a given that Infosys will revise downwards its growth guidance again in October, when it declares its second-quarter results. Still, one heartening feature among the largest homegrown IT firms is that they are investing in newer technologies to make themselves future-ready and also improving their execution capabilities. Both Infosys and TCS are making investments in blockchain. All three firms—Infosys, TCS and Wipro—continue to strengthen their offerings in automation and artificial intelligence-based platforms. Infosys is already seeing early gains, earning $52 million in revenue from its platforms in the April-June period. “A paradigm shift has happened in the market," said Wang of Constellation Research. “Economic slowdown (Brexit) does play a small role; however, the services firms have been cautious in building out new business models, IP (intellectual property), and service offerings. Doubling down to deliver on scale will not work. We are entering a world where every IT services firm needs to see more than one service line into each account. In fact, the services firms that deliver on account-based marketing (ABM) and account categorization will succeed. Accenture has done a better job of ABM and account categorization". His reference is to IT firms doing more work, and in newer areas, for existing customers. Still, it will be foolhardy to pronounce the death of Indian IT, reason executives and analysts. Companies are taking steps to address each of these challenges (investments in intelligent platforms, automation, partnerships with cloud computing firms, and forging partnerships with start-ups), and many analysts believe that if executed well, the country’s technology titans can return to double-digit growth.